There was attendance from the Methodist church with Rev M Thompson (circuit superintendent), Rev E Edwards (Atherstone) and Mrs A H Rogers (Edgbaston). 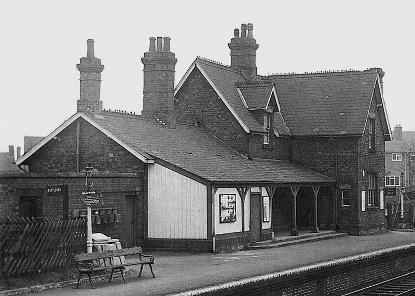 Local men and women included Mr and Mrs Reginald Stanley, Mr and Mrs Richard Train, Mrs Bradbury, Messers W. Standley, F.R.Jones, Whitehead, W.A Longley, James Randle and Joseph Hutt. In total 38 bricks were laid. 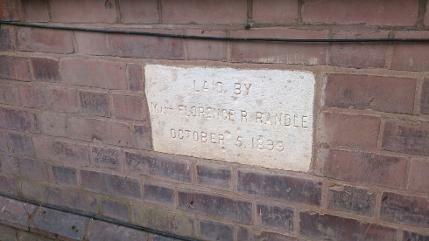 James Randle's daughter Florence R Randle aged 8, one of the few lucky children who had a brick laid for them. 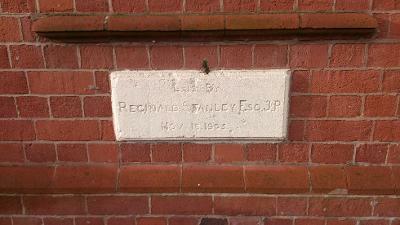 Reginald's adopted daughter Annette (16) and Margaret Stanley (18) also had a brick at a cost of £10 each. The total money raised from the ceremony was £68 2s 1d. Afterwards a tea was provided on the field opposite and were well catered for by the Whittleford ladies. Later that evening with the weather a little cold a few words were spoken by James Randle and William Standley, praising the efforts of all involved. Francis Jones then gave the finishing financial statement from the day events Reginald Stanley had given a noble gift of £200 (£21,000 in today's money) to the pot and it in the end the figure was close to £400, leaving them just £300 to raise. Finally Rev M. Thompson and Joseph Hutt said a few words to conclude the evening. Stone laid by Miss Florence Randle, who was just eight at the time. It must have been a special moment for the little one. Not looking in the best state today (2014). Miss Annette Marie Stanley, Reginald adopted daughter who was a young lady of sixteen when this was laid. 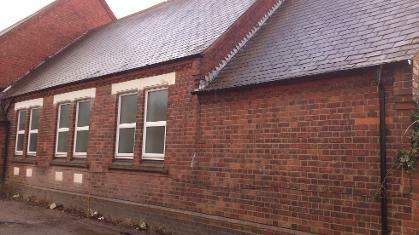 The Whittleford Methodist family in just over six years had outgrown the school buildings and small chapel on Church Road. Sunday mornings and afternoons where for the children and evenings it was cleared for the adults. Various organisations where using the now cramped rooms for social and religious events. It was therefore decided to erect a Church at the front and two more classrooms to accommodate the now 50 odd members. The work had been quoted at £1000 and at the time of the stone laying ceremony they had donations to the amount of £400. Another 94 bricks were laid with the initials of the layers. In the evening a public tea was held in the Stockingford School, followed by a meeting in the Stockingford Chapel and presided over by Mr D B Bates, along with trustees and officers of the Church including Mr Jesse White, Mr W Jennings and Mr Moon. 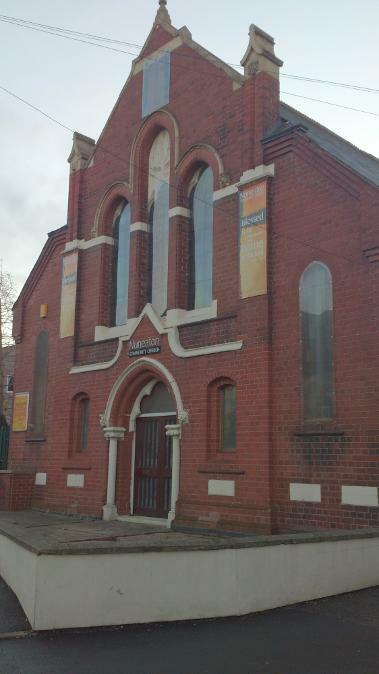 Above left- the old Whittleford Wesleyan Chapel now the Nuneaton ------- Church. 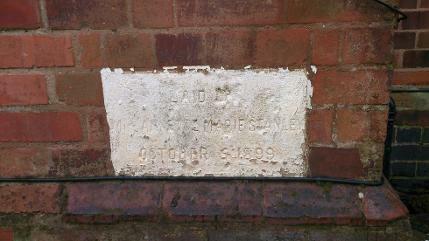 Above right - Reginald's plaque one of just a few that has survived the rigours of the Stockingford wind and rain. 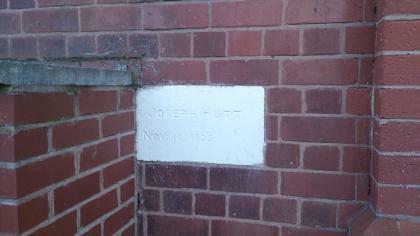 Below centre Mrs J Hutt's plaque partly hidden by an additional box.